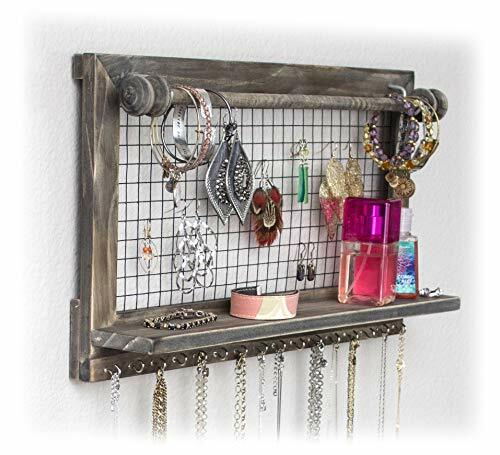 The SoCal Buttercup Jewelry Shelf is the ultimate hanging jewelry organizer, ready to store hundreds of jewelry pieces, keeping them tangle-free and ready for easy access! Made of high quality hardwood with a rustic feel. It features a lift-up rod for organizing bracelets, watches and other larger accessories. The included wall mount screws and anchors make installation a breeze. No Assembly required. 16 cup hooks along the bottom make hanging your necklaces so simple and easy. The back wire mesh allows you to hang and organize earrings. No more drawer or dish full of miscellaneous clips. No more lost pairs. The SoCal Buttercup Jewelry Shelf provides plenty of room for bracelets, nail polishes, earrings, perfumes and more! INGENIOUS DESIGN: Organizes earrings, necklaces, bracelets and accessories to keep your jewelry tangle-free! READY TO HANG: Wall mounting screws and anchors included for easy quick installation. No assembly required. PERFECT SIZE: Designed to fit on your bedroom, closet, or bathroom wall. 17.5" x 10" with 3" shelf and 16 storage hooks. CUSTOMER SERVICE: You Love Them Or Your Money Back For Life - We Keep Our Promises To Our Customers And Treat You Like Family! If you have any questions about this product by SoCal Buttercup, contact us by completing and submitting the form below. If you are looking for a specif part number, please include it with your message.